When Chad Christman was 4 months old, he went for a drive with his parents. The year was 1980, and Christman was sitting in his mom’s lap in the front seat of the car. His brothers were in the back. At an intersection just off East Sprague Avenue, the vehicle was hit so forcefully by another vehicle that Christman went airborne, flying out of the car. Police said the accident was so violent and the cars so mangled, it looked like it had happened on the freeway. “At the time there were no seat belt laws or car seat laws, so it wasn’t unusual that I sat in my mom’s lap,” said Christman. The rest of the family escaped with bumps and bruises – but Christman was badly injured. Today, at 30, Christman is the IT administrator for Goodwill Industries of the Inland Northwest, and he just received Goodwill’s national 2011 Achiever of the Year award because of how far he has come since that fateful day. After the car wreck, Christman spent a lot of time in hospitals, mostly at Shriners Hospital, where he was fitted for leg and back braces. During middle school he spent almost two years at Shriners while doctors tried to save as much of his mobility as possible. He was never able to walk, but he has upper-body mobility. Using a wheelchair caused severe scoliosis (curving) of his spine and at one point he went through back surgery. After one round of surgery he lost feeling in his right arm and hand. “It works, but it still gets cold sometimes and it’s not completely OK,” said Christman, lifting and flexing his right arm. Growing up, Christman said he treated his wheelchair much like a skater would treat his skateboard. At his childhood home in Hangman Valley he’d race down the road with his friends, never one to be left behind. “I’d do anything in my chair. I used to have to jump the curbs because there were no cutouts,” said Christman. He went to the Rose Bowl with the band at Ferris High School before graduating from Shadle Park High School. After high school he was unsure what to do, but took some college classes and went out to live on his own. Employment opportunities were limited because, as Christman puts it, people mostly saw his chair. He finally connected with Goodwill in 2003, and his first job there was to sort toys. “I think they got annoyed with me because I went through the boxes too fast,” Christman said, laughing. Through ongoing job evaluations his computer skills were brought up again and again. “I built a computer network at home out of the computers we had,” said Christman. 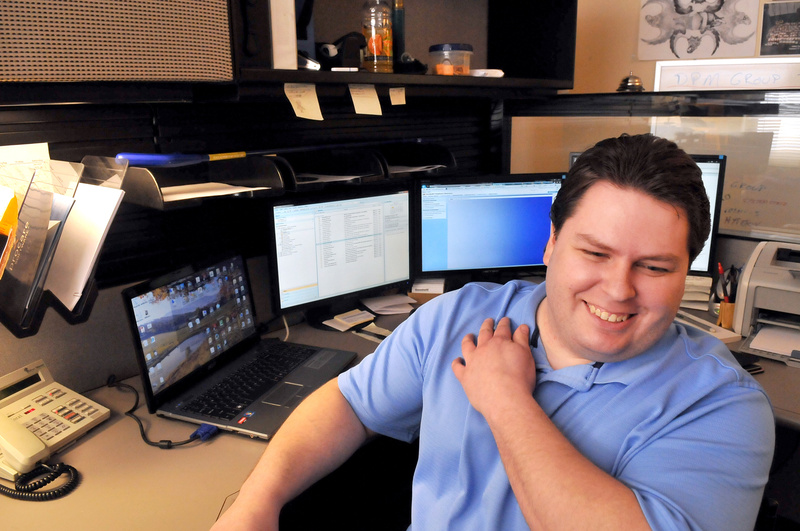 Some computer classes and a yearlong internship at Itronix launched Christman into his new career. The maintenance staff at Goodwill has helped Christman design a cart that hooks onto his wheelchair so he can transport computers around the office. He loves his job and said he’d like to stay in the IT department as long as they will keep him there.